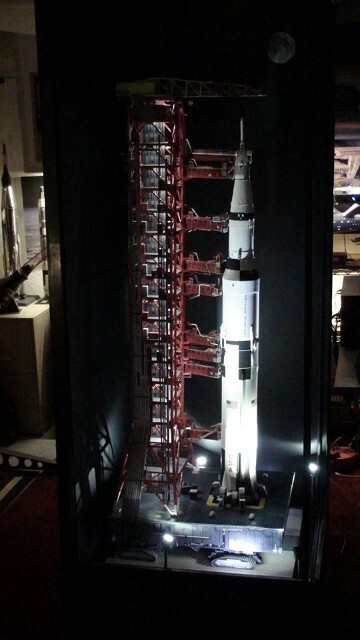 Over the past few weeks, I've been corresponding with a gentleman, Mr. James Schwartz, who had acquired and built an Edu-Craft 1/72 scale LUT for his Dragon Saturn V model, and wanted to use the LED lighting scheme for the LUT that I employed on my 1/96 scale version, and showed on this website. He did a fine job of installation and was sufficiently proud of the work that he wanted to have it on display in a prominent area of his home. This meant that the model needed protection, so he designed and fabricated a display enclosure for the system, which he shared with me in photos. This got me to thinking, "Wouldn't it be nice to finally have one of my works on display like that?" So, I set about the task of designing the cabinet, procuring the materials and beginning the fabrication. My cabinet was a bit different than Mr. Schwartz' as his 1/72 scale model had to rest at floor level in order to "fit" into the room. In 1/96 scale, I wanted to elevate the model off the floor a bit, which would leave some space underneath. I therefore turned that space into a storage drawer, to hold Apollo-related books, DVDs and other memorabilia. I used the same LED flashlights that Jim had found on Amazon.com for "spotlights" to illuminate the pad in a realistic night-time scene, but also added warm white LED lighting to the "crown" of the cabinet, to provide a more day-light look to the model on command. Both lighting circuits are controlled by separate switches on the back side of the cabinet. After looking at the lights for a bit, I decided to add a "pencil-beam" LED light for the Moon, which is placed on the interior wall of the cabinet, to enhance the night-time scene. Although not shown in the photos, there are 1/4-inch thick glass panels which slide into channels on both open sides of the cabinet, which will provide the protected environment. Once the cabinet has been moved upstairs into the main part of the house and placed where it will remain, the glass will be installed.